Featuring GlowLight® Illumination It's powerful enough to read in bed or in the bright light of the sun. NOOK's most advanced Ambient (Always-On) GlowLight technology lets you enjoy an evenly dispersed light. This is a USED item but it has been tested and cleared. There may also be sticker residue on the back. The item that you receive may show different signs of wear, but will not exceed the conditions shown in the photos. Kindle E-reader (Generation - 8th) - Black, 6" Display, Wi-Fi, Built-In Audible. This is Black Kindle, NOT Oasis. This Barnes & Noble Nook Simple Touch is fully functional and in excellent working condition. There is minimal wear on the body from normal use, as shown in pictures. It does not affect the functional integrity of the item whatsoever. Condition rating 9-10. Comes with charger. Great gift. Has minor scratches and signs of use. Amazon Kindle 8th Gen Model SY69JL, 6" WiFi, 4GB,Touchscreen. These Kindles are used but they have been tested and are fully functional. Because they are used they may show average signs of use, including multiple scratches, scuffs, signs of discoloration, and other noticeable blemishes. Amazon Kindle Paperwhite (7th Generation). 4GB, Wi-Fi, Black, 6" Screen. Does not include charging cable. Amazon's Kindle Paperwhite has a sleek, modern design so you can read comfortably for hours. Features Amazon's signature 300ppi, glare-free Paperwhite display, laser-quality text, and twice the storage of the previous generation. Icarus Illumina 6" Android 4.2 E-reader Boyue T61. Condition is Used. The item is running the Icarus software. The item is in excellent condition. The battery still holds a charge for about a week on standby, using battery management apps. The item has a backlight, physical page turn buttons and the Google Play Store. Excellent condition. No scratches on screen. It's been wiped and reset. Amazon Kindle Oasis E-reader Black High-Resolution Display, Wi-Fi, 6" 8th Gen.
Kindle Oasis also includes the ability to invert Black and White, adjust font size, font face, line spacing and margins. Learn more aboutAccessibility for Kindle. Our thinnest and lightest Kindle ever--read even more comfortably for hours. 100% Positive Feedback! 90 day warranty! Fast Shipping! The pictures you see are of the actual item you will receive. Barnes & Noble Nook Simple Touch, BNRV300, Wi-Fi, 6", 2GB. This Nook is used and in fair condition. They have been tested and are fully functional. Because they are used they will show heavy signs of use, including but not limited to multiple scratches, scuffs, signs of discoloration, and other noticeable blemishes. Photos provided are the actual item you will be receiving. New, no box. Factory protective covering still in place. Amazon Kindle (4th/5th Generation) 2GB, WiFi, D01100, Black, eReader. Screen has many scratches and/or a dead pixel. Amazon Kindle Paperwhite 2nd Gen. Wi-Fi 3G, 6in - Black. This is a USED item but it has been tested and cleared. There may also be sticker residue on the back. Amazon 6" Kindle (4th Generation) - Graphite (B0051QVESA). Condition is Used. Shipped with USPS Priority Mail. Comes with charging cord only. Our thinnest Kindle ever. Reimagined page turns-PagePress enables you to turn the page without lifting a finger. Battery lasts weeks, not hours. We are quick to respond and always happy to help. Charging cord. Onyx BOOX Max Carta 16G, Wi-Fi, 13.3inch - Black. Condition is Used. Shipped with USPS Priority Mail. Item in good condition, all functions work. It comes with the original case, stylus and charger. Also includes a 16g microSD card. Please leave message for additional questions. Thanks! Amazon Kindle Oasis (9th Generation) 32GB, Wi-Fi, 7in - Graphite. Shipped with USPS Priority Mail. An ebook reader is designed to give you access to a library of electronic titles. You can read the material on a screen and turn the pages by a swipe of your finger or by pressing a button. Different models are able to access titles from specific libraries. An ebook reader is similar to a tablet computer. It is a handheld device that allows you to download certain e-books to read. You will have access to the electronic bookstore associated with the type of reader you have. You will be able to store multiple books digitally on eReaders. Also, you can use a Wi-Fi connection to buy more titles, read reviews, and download apps. What are the different types of e-readers? There are many types of ebook readers on the market. Besides the variety of styles to choose from, there are different libraries available as well. If the reader runs the Android operating system, it can also run apps that are available from an app store. The features are what make each ebook reader unique. Some features, such as a backlit screen, make it easier to read a title. Reading should be enjoyable, so you want a reader that works well for you. Backlight - Be able to read in dark situations without an external light. Bluetooth - Connect Bluetooth speakers and other Bluetooth accessories. Built-in Keyboard - Access a keyboard to search for titles. Camera - Take photos and videos with your device. Touchscreen - Use a touchscreen for swiping to the next page and selecting titles. How do you buy an ebook device? When you have an e-book device, such as a Kindle or Nook, it is advantageous to have e-books as opposed to paperback books because they take up less room. You can have an entire library on your device. As you shop for e-readers, it is important to learn about the different aspects so you can select the right ebook for you. 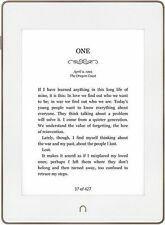 Brand - Choose an ebook reader based on the brand's reputation and the offer. Features - Review the features of each specific model. Battery Power - Determine the battery usage time you will have between charges. Storage - The storage capacity may range from 2 GB up to 128 GB. Access to ebooks - Different e-books are available on different e-reader platforms.